How do I end a stencil design so that it ends perfectly at the corner of my room? How can I add depth to my stenciled designs? I want them to look more life-like. How do I stencil on fabric? Can I stencil on tile? I would like to stencil fabric for upholstery. What paint do you recommend that will hold up to daily use? I am preparing to stencil a metal mailbox that will be placed outdoors. What type of paint do you suggest I use? I will be stenciling a dresser that has been painted with an interior semi-gloss. Can I use semi- gloss paint on top of the semi- glossed surface or do I need to purchase acrylic paint? I am thinking of stenciling an old porcelain sink. Do I need to use a special type of stencil or paint? How do you stencil onto candles? How do you use paint crayons to stencil? What is a stencil overlay? Simply increase (or decrease) the space between the repeating elements of your border or design. Another option would be to place a coordinating design between the repeating elements, in such a way that increases (or decreases) the space needed to make your design end right before the corner. Obviously, if your border does not contain repeating elements, this would not be applicable. If you have a design that is continuous, you can try to extend (or shorten) various portions of the design to make it "fit". You can do this by adding shadows using the same stencil. For example, if you wanted to place a shadow near leaf that you've already stenciled. Take your leaf stencil and trace on a piece of paper. Cut out the leaf. Place the cutout on top of your previously stenciled (dry) leaf and secure in place with a small piece of masking tape. Take your leaf stencil and place it just beyond your cutout, where you would like the shadow of the leaf to fall. Stencil this "shadow" portion using a shade of gray. Before stenciling fabric, wash and dry fabric according to label instructions. This will remove the sizing (chemical coating) in new fabric. If this sizing is not removed, your stencil paint will not bond well with the fabric. Place a piece of cardboard under the layer of fabric being stenciled. This is to prevent bleed-through to other parts of the fabric. Secure your stencil in place with low tack masking tape. Load your brush and stencil. Apply several light applications of paint, instead of one thick application. Allow fabric to dry for at least 48 hours or according to manufacturer's instructions. 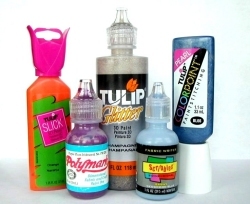 Some fabric paints (and stencil cremes) need up to two weeks for the paint to cure. Curing for other paints require heat application ins some form, either by covering the stenciled area with a cloth and applying the heat with an iron or the clothes dryer. Check the manufacturer's instructions for proper heat setting and laundering instructions. If your tiles are already installed, I recommend that you clean the ceramic tiles with vinegar and warm water or rubbing alcohol. Allow them to dry thoroughly. Secure the stencil with masking tape. Ultra Gloss Air Cure Enamels by DecoArt is a popular brand of paint. There are many other brands on the market that work well, but be sure to read the manufacturer's instructions before you bein. Always use a clean, very dry brush. A damp brush will cause your paint to run. If you need to thin the paint, never use water. Instead, use DecoArt UltraGloss Clear Medium. Load your brush and remove most of it using a paper towel. Use a stippling motion to apply the paint to the stencil openings. It is far better to apply the paint in light layers, one layer at a time, allowing the paint to dry to the touch between layers. When you remove the stencil, it is sometimes necessary to clean up the edges of the stencil design with a sharp edge or tool. Allow the paint to cure. Curing time varies according to the manufacturer. If you are painting an object that can be baked, do so, as baking will increase the durability of the paint. If the object cannot be baked (such as tiles that are already installed) take a hair dryer and dry the painted designs thoroughly. We never recommend scrubbing tiles that have been stenciled. A gentle wiping motion is all that should be used. Protecting your stenciled tiles is important. DecoArt makes a ceramic glaze to apply after the tiles have been painted to create a harder wearing finish/protective coat. This is a must. If your tiles are not installed yet, all the better. 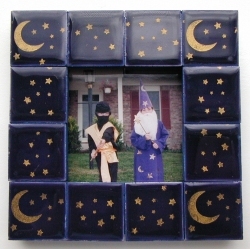 If you can paint the tiles and then bake them in your oven, the painted surfaces are at least 2-3 times more durable. We still recommend using the ceramic glaze to protect your stenciling work. Make sure to read the label for additional instructions, such as oven temp and time, etc. After some research, I found a website that would answer that question better than I. The website is: http://fabricpaint.com/library/PaintingUpholstery.txt They recommend a paint made by Tri-Chem called Stencil-On Paint. We recommend No-Prep Metal Paint by DecoArt. There are a variety of colors to choose from , no primer or varnish required and it is easy to clean up. We do suggest though that you do a sample design first to test for colorfastness. You can go right ahead and use the semi-gloss paint. No need to use acrylics. You can use any type of stencil however you will have to use a paint especially designed for porcelain surfaces. We recommend Porcelaine 150. Porcelain paint does have to be fired or baked in the oven. With the Porcelaine 150 paints you can bake them in the oven at 300 degrees for 35 minutes and then allow them 24 hours drying time. They come in a variety of colors and are soap and water washable before baking. You can find out more about these paints at www.pebeo.com. We recommend combining equal parts of our Apple Barrel Acrylic paint with DecoArt's Candle Painting Medium. The candle medium will allow the acrylic paint to adhere to the candle without running or separating. You would remove the seal from the end of the crayon using a wiping motion with a paper towel. Apply a circular spot of paint onto an uncut part of the stencil you are using. This will serve as a palette for you to swirl your brush in. Apply paint to your brush and begin stenciling. An overlay is a separately cut stencil for specific parts or colors of a stencil design. For example, if you look at the stencil below (TF53), the design is made with two overlays. The first overlay contains elements that you would most likely stencil colorfully (cars). The second overlay contains elements that you would stencil black (engine car, wheels, track). Therefore, each overlay contains elements for a specific color group, to make stenciling quicker. Generally speaking, the more complex the design, the more overlays required.